The lush, verdant suburb betwixt the Brown Snake and the Farm, Newstead is your typical picturesque suburb powered by the buzz of the inner-city. People have dubbed it Brisbane’s answer to both Chelsea and the Flatiron District; a summation with which we heartily concur. Case in point: Newstead’s food scene, which deftly caters to casual and fine diners without raising the dress code higher than a well-cut sports jacket. Big enough for group dinners and licensed enough for boozy lunches, Mrs. Brown’s is perfect for satisfying whatever mood strikes. Their menu is a spectacular feat of tacos, wings, dumplings, and charcuterie, and they outsource to nearby Gianni’s so you can even get a premium slice of the Italian pie. Knock it all back with a bottle of Aussie wine or a cocktail jug and you’re laughing. A joint effort of Brisbane culinary legends Paul Hoffman and Nick Pinn, Drum Dining is the good-looking rooster this town has been craving. Their plates are the epitome of contemporary Australian dining: simple and delicious, with maximum care taken for minimal fuss. We love Drum Dining because their mood is a perfect smart casual, just whack on a nice jacket and you’re good to go, and while high heels are optional the croquettes are mandatory. They’re that good. In constant pursuit of the mellow, beachside vibes of their Noosa hometown, Betty’s Burgers is an orange-striped dream for any midcore grill fiends. Theirs is a classic burger, fries, and shake situation, doing all three perfectly as well as a pretty hectic concrete soft serve for afters. If you like the cut of that jib, pledge your allegiance with some of Betty’s souped-up merch. Hanging their hats on oceanic delights, Reef Seafood offers up the tastiest seafood in Newstead, fresh from the waves. Their fish and chips are as premium as you’d expect, with Asahi-battered or panko-crumbed fillets on offer, but thanks to the exquisite freshness of the flippers in the cabinet, you’d be nuts to pass up a chance to sample an ultra-juicy sashimi platter. Defying conventional categorisation, The Defiant Duck sits somewhere between a gastropub and a smokehouse, which is why their menu is so bomb. Stuff like burgers, chilli dogs, and ribs can be ordered alongside a parmy and a 500g rib steak. If the riot of options makes choosing difficult, just know there’s no shame in building a whole meal out of Defiant Duck’s starters and sides. Since making the move from their original digs in the city, Newstead now gets to claim Phillip Johnson’s culinary institution as its own. 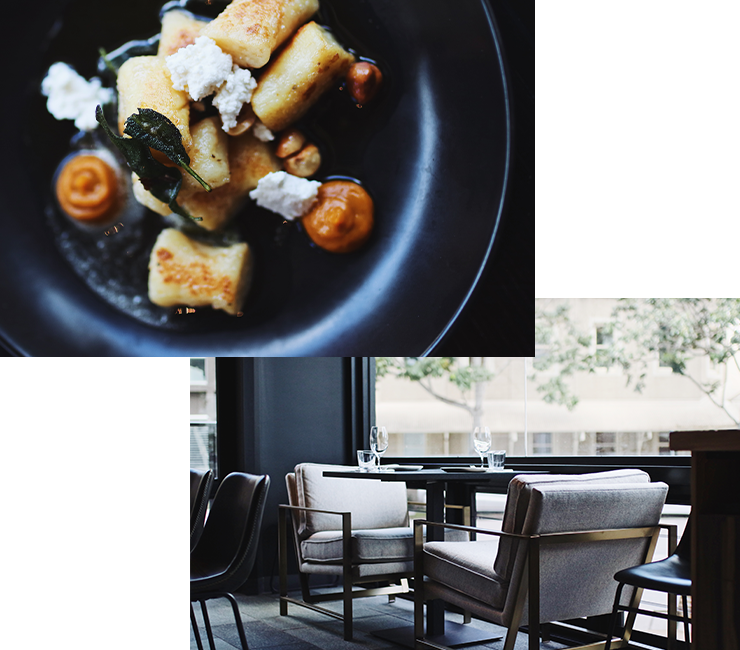 Best known for setting the standard of fine dining in Brisbane, e’cco Bistro’s ability to adapt and revamp has secured its longevity at the pinnacle of our restaurant scene. We definitely recommend saving room for dessert, those DIY ice cream sandwiches aren’t joking around. Schmick, modern Italian knows no other name since Salt Meats Cheese turned up in Gasworks, wooing punters with all-you-can-eat pizza on Monday nights, gnocchi madness on Tuesdays, and cheese wheel pasta every Wednesday, as well as the most amazing charcuterie and spritzes all week. And just in case you thought they would ever leave you stranded, Salt Meats Cheese even does breakfast every day of the week. When does a bowl stop being a salad and start being poké? The answer lies in poké’s Japanese and Hawaiian pedigree, which sees sashimi, nori paper and all the other components of sushi served in a bowl of plenty. But Cheeky Poké takes it one step further, offering their colourful, clean poké in taco form for those days you just can’t be doing with flatware. Your daytime saviour guaranteed to re-pep your step, BUZZ Bistro is about pleasing everyone. Their eclectic menu covers everything from all-day breakfast to light meals to burgers and pizzas, and that cheeky liquor license always helps. With intricate and bizarre flavour combinations, Rogue Bar and Bistro isn’t the place to get a basic feed. As the name suggests, these guys are known to go a bit off-script and both their breakfast and dinner menus feature experimental dishes that’ll blow your mind clean away. But besides the usual service, Rogue likes to keep things spicy with events like their four-course dessert degustation (which is basically hitting repeat on the best part of dinner). Like that mystical suburban paradise young couples are always mooning after, Malt Pier is situated just far enough from the bustle of Gasworks, but still close enough to the action that they’re kept in the loop. They’ve just got everything from morning to night sorted. I’m talking cocktails and crepes for breakfast, spanner crab linguine at lunch, and an uncomplicated menu of hearty dinners to go with some cracking river views. They stop juuust short of a spicy number but we’ll let it slide because Number 68 is a reliable pit stop for Newstead locals in need. Besides some particularly noshy egg and bacon rolls (which are pure fire) the evergreen 68 also trades in fresh baked muffins and specialty coffee, as well as craft beer, burgers, and boutique wine.